On Wednesday this week we held the SUSU Annual General Meeting- where every single student can submit and vote on policies. Amazingly, we had a record breaking year with the highest ever number of: ideas submitted by students (161); policies submitted by students (19); and proxy voters (563), which is a 46.2% increase on last year. We also had a great level of debate at the meeting about the policies- some of which have proved to be a little controversial! I’m so proud that students are submitting brave policies, and that they are being debated and discussed on such a huge scale across the student body. One thing that does disappoint me a little though, is when I see a minority of students saying things like ‘SUSU have passed x policy’- normally with a negative statement attached about their personal opinion of that policy. I’m one hundred percent supportive of students voicing their opinions about policies, but it does frustrate me a little when students imply that ‘SUSU’ is the one who’s forcing policies onto students. We need to remember who SUSU is. SUSU quite literally is its members – every single student at the University of Southampton- and if you’re complaining about this faceless entity of ‘SUSU’, I’ve got news for you: you are SUSU too, just the same as the volunteers, sabbs, and staff who put so much work into it. See my comment on this Wessex Scene article as an example/for further shade. I’m not saying we’re perfect, or that I necessarily agree with all the policies that passed, but they passed because they won the majority of votes from students. Those who didn’t vote are just as responsible for the policy passing as those who did. Of course this shows we all (especially my position) need to do more to communicate about the AGM and get students to engage, but I think we are at least making positive steps with the amazing figures and debates we had this year, and hopefully with the improved system next year, things will be much better. I do want to give my huge respect for all those who did take the time to submit an idea, submit a policy, vote online, and attend the meeting- you were all part of the change. And most importantly for me, the Democratic Reform passed! So for all those who complained about the ineffectiveness of policy- I agree, and that has now been changed! As of the start of the next academic year, we’ll be saying bye-bye to policy and Union Council, and hello to a more online, simple, and engaging democratic system. Find the full changes here. This was the proposal that will completely rewrite our democratic structures. We did have an amendment submitted about gender balancing, which was very hotly debated, but eventually the amendment was referred out to democracy zone. That means that for now, the original proposal stays- meaning that at least half of the open places on each zone will be reserved for women. This passed, but with the important change that we voted to remove the section that said ‘To stop selling bottled water in all Union-controlled outlets’. So the policy now basically means we will lobby the University to stop selling it, and sell reusable bottles more in our own outlets. Someone tried to refer the question out to another body (so it wouldn’t be voted on in the AGM), but this attempt failed. Although there was much debate against the policy in the room, the overall votes meant that the policy passed. It was also quite close, with 126 votes for and 106 against. This policy passed with 163 votes for and 25 against, meaning we will lobby the university to improve the system for selecting module choices. This motion also overwhelmingly passed, meaning we will lobby the university to introduce a pay-as-you-go gym system, and the Sustainability zone will work to increase participation, especially supporting students from lower income backgrounds. This policy passed by a clear majority as well. It particularly spoke about having more choice for vegetarian, vegan, and halal diets, as well as better overall choice for a variety of dietary needs. This policy means that SUSU will no longer fund student group flyers/leaflets, but it doesn’t stop them funding their own. As you may have seen in the BBC, Telegraph, Daily Echo, or Wessex Scene, this policy did indeed pass, but was perhaps surprisingly controversial with 176 for and 86 against. This was only the initial stage in the rule change process, so for this to be completely passed, it will have to come as a rule change to Democracy Zone and Union Council . This policy passed with 172 votes for, and 44 against. It’s important to note that before the overall policy passed, we passed a motion to remove the part of the policy that specifically prohibits the Union from selling products containing palm oil. So this means we will still lobby the University to stop using products containing palm oil, and work with our suppliers to find alternatives, but for now we can still sell products that contain palm oil. This policy proved to be quite controversial in the room, with lots of students commenting on the large resource implications involved. Someone tried to pass a motion to remove the part mandating SUSU to invest in the sleeping pods, but that failed, so overall the policy passed. Make the Stags seating more efficient- Referred to Trustee Board. This means we should get rid of the booths and replace with stools/tables, so that we can fit more seating in. The issue will now be discussed by Trustee Board. This means we will be doing consultation about the effects of the Prevent agenda on our students, and forming a Union stance on the issue based on what our students want. This pretty much does what it says in the heading, and it passed with 174 votes for, and 47 against. So now we are mandated to lobby the University to offer December graduation to masters students, many of whom are international students who would have to re-apply for visas/pay for travel etc to return back to the UK for their graduation. VP Sports Development will now lobby the University to invest more in redeveloping the boat hard site. Someone proposed a motion to withdraw the question, which passed, meaning the policy was withdrawn and did not pass. The rest of the ideas that were submitted to the AGM as part of the Change One Thing campaign, but didn’t come as policies will be taken to Zones meetings- so don’t worry, they haven’t been forgotten about! Thanks again to everyone who took part in the AGM- if you care about a policy that passed- spread the word! 8 Comments on "SUSU AGM: The real story"
One thing to point out first, your statement that “I have news for you: You are SUSU!” is as sarcastic as it is pointless. Of course, you can criticise something you are part of, and the claim of the article is not that SUSU is just the leadership or faceless entity, but rather that the leadership of SUSU have let themselves down here. Saying the leadership of SUSU is not the same as the leadership IS SUSU! They also “won the majority of votes from students” from a proxy system that is unrepresentative and, in ways the article points too especially on this issue, potentially rather bias presuming that to pass this policy HAS to be the most sustainable thing. Surely SUSU have passed ‘x’, if SUSU is its members, because its members have passed it…. Perhaps it is sarcastic and pointless, I guess it expresses my frustrations that have built up throughout the year though about when students seem to divorce themselves from SUSU and treat it with an attitude of: ‘They have done something to me’, or ‘I am not part of SUSU’. This may just be my interpretation, but when you’re trying to get everyone to feel part of, and participate in SUSU, it feels very disheartening. You certainly can criticise something you’re part of, and I really encourage it, (just ask anyone at Union Council), but it would be nice if people would strive to give constructive criticism to help make improvements, and claim some ownership of the system that needs improving, rather than casting it off as another SUSU slip up. Also, I’m not referring to any article, but a trend of things I’ve seen in a variety of forms throughout the year, not just from the AGM. There are always things we can do to improve, but what would you like the leadership of SUSU to do instead? The proxy voting system does have its issues, but most importantly it gives every single student the chance to vote- of course it would be silly of me to suggest that this happens in practice, but we are increasing our voting turnout for the AGM. I do think there is a valid point that it does promote just a positive side of the policy, but perhaps next year we can more actively encourage online debate about policies before the meeting to ensure a more even discussion. We’ve also just improved the democratic system to work better throughout the year, but if you have any suggestions for a better system that allows every student to vote on a large number of policies and reaches as high a level of engagement, please let me know! Yes SUSU has passed the policy as an entity because of its members, so let’s embrace that with positivity that we have so many students who are pushing for brave change, and getting involved with democracy. I think it’s exceedingly telling that almost everything passed. In fact everything except building numbering, which was withdrawn at the AGM. This is despite the fact that a number of these are extreme suggestions with very little nuance (I mean “ban all plastic”. That’s what it says in the proposal, no more subtlety or specificity than that). That is because what you have is not student engagement. You have interest group engagement. I only heard the AGM was even happening because a friend of mine saw a post from one of the policy submitters urging her friends and fellow society members to vote positively for it, and that’s symptomatic of this entire situation. The reasonably high vote count in comparison to the attendance (less than 40, I’m told, less than most society AGMs!) is indicative of groups of people with a certain view flooding to vote positively on the policies their members have proposed, but who do not care about the union in general. Frankly until there is a half decent effort made to engage students on things like this (the only e-mail from SUSU on the topic is from mid April, and it’s telling me to submit stuff to Make A Change. No tablet voting on campus, no Facebook posts linking to the voting, no engagement with big student societies to disseminate info) then you are not doing a remotely decent job of representation, and all proxy voting is offering is the ability for student groups to push through arbitrary policy with relative ease. Maybe the people angry at SUSU are angry because they didn’t even know they could vote because they were never informed. To pass it off as “Well you ARE SUSU, you can’t possibly be annoyed at it” is just a dereliction of duty with regards to engaging your membership. I agree that it is exceedingly telling. Bruno made some good points about the fact that unless you watch the debate at the physical meeting, you’re most likely to just get the one, inherently positive, side to the policy- we can and should do more to facilitate a more balanced discussion for online voters, and this is something I’ll be handing over to my successor. Perhaps part of the issue is that voters may just read the title, and not the full policy, so maybe we should give short breakdowns of what the idea will mean in practise to help inform voters. Surely that is still positive engagement? To my understanding, what you’re talking about is grass roots engagement, with students who care enough to make positive change going out and talking to other students and persuading them to also care about that change- is there anything wrong with that? There’s nothing to stop students who are against the policies also campaigning for people they know to vote against it. I also think that students are more likely to engage with specific ideas that they feel strongly either way about, than to engage with a general concept of the AGM- so the more ideas students bring and the more they work to campaign on those ideas, the better. No one will ever care about an empty agenda, so I’m glad that we have had so many students submitting ideas and raising awareness of them. It would be amazing if students automatically cared about the AGM, but I think the way to reach this is demonstrating the types of meaningful (either positive or negative) change happens there. You say that students don’t care about the Union in general, and perhaps that’s true- but what is the Union if not the very ideas and changes that our students care about? Even if a student only cares about one policy bought to the AGM, that means they do care about something happening at the Union, and at least the AGM has provided a way for that policy to be publicly debated and voted on. Hopefully the improvements with the democratic reform will also mean that there are more opportunities for us to get mass student input on ideas throughout the year, rather than just at the AGM. I’ll never say that we did a perfect job, but I would like to think we did make a pretty strong effort to engage students. We’ve had a poster campaign for a few weeks, and we’ve also had a social media campaign shared by all of the sabbatical officers and the official Union pages, many of these did link the voting. For reference, see my facebook page for the idea of some of the posts https://www.facebook.com/suvpdci.southampton, I also posted the voting link in most of the halls facebook groups; mature student facebook groups; and post-grad student facebook group. We did also email every single member of a student group committee, and I did multiple posts urging other volunteers/student leaders to spread the word (though I’m not sure if many of them did). Like I say, I realise we can still improve a lot, and I’d love to hear suggestions of how you think we should do this, but I hope it’s a fair statement that we at least made an effort! Why would we “celebrate” a tiny handful (less numerous than the “small minority” which you so loudly criticise) of zealots who pushed through a bunch of policies, taking advantage of SUSU’s (the leadership’s, for clarity – I’m talking about you) atrocious record when it comes to engaging the students? 200 people voting on a policy is nothing impressive. The figures aren’t impressive nor amazing – they’re just a tinge less sad than they were last year. I think we should celebrate them because they took the time and effort to try and make positive change (this may be subjective to others, but I think it’s a safe bet that the policy submitters had good intentions). I think it’s a little unfair to say we have an atrocious record. We do still have a long way to go, I’m certainly not denying that! But we have improved this year, and whether the figures are impressive or not to you, they do show positive steps. 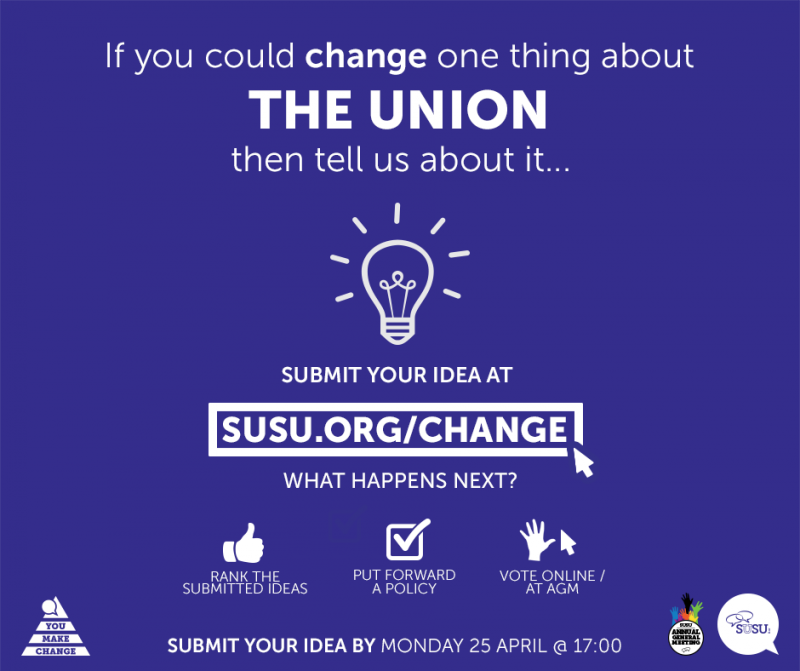 If you want to change things about the way we do things, or aren’t happy with them- then please submit an idea to you make change, come and speak with one of us, or come along to the last Union Council on the 6th June- we’re always looking to improve, and student input is the only way this will happen! Great job Kerry! I know you work very hard on this campaign and it hasn’t gone unnoticed. I feel this engaged at lot of people and was wonderful in brining the student community together!